I enjoy movies set inside the music scene like: Almost Famous, Crazy Heart, Walk the Line, Inside Llewyn Davis, La La Land, even The Runaways, with Dakota Fanning and Kristen Stewart playing Cherie Currie and Joan Jett, it's pretty bad, but still has something to recommend it. These movies depict some aspect or time period of the music industry. 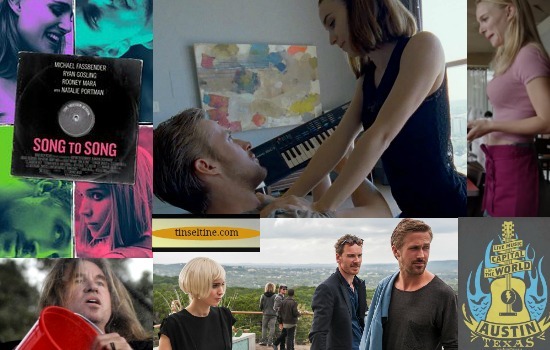 Where as Terrence Malick's SONG to SONG professes to be about the music scene in Austin, Texas, but other than a scene or two with a beat down, rogue eyed Patti Smith and a bloated, straggly Val Kilmer on stage taking a chain saw to a speaker, you'd never really know the film had much to do with music at all. Instead, the plot seems to revolve around Rooney Mara's flat stomach and the fact that both men and women like to caress and kiss it; with Ryan Gosling winning the honor of having the most covetous access to Mara's tummy. And a B story all about Rooney Mara's constantly changing hairstyles, and wigs. But Biblical references aside, none of that explains a bare bones plot, pointless and trite voice-overs, constant PDA's and playful encounters, all with the underlining of a foreboding which never actually materializes. Bottom Line: Just like Malick's movie which opened last March, Knight of Cups (click for T&T post) we've been given another long, glossy magazine shot, masquerading as a film, with an amazing cast, who are not provided with enough dialogue to keep you from taking several snoozes during the 130 min run time.